On a Sunday evening roughly 10 years ago, Sean McCall – while engrossed in community policing – ran into a scenario that changed his life forever. He saw a woman – then unknown to him – signalling the police vehicle he was operating to stop. He – softened by her appeal (no pun intended) – decided to do what police officers don’t do regularly. He gave her a ride. “To be honest, I was on patrol one Sunday evening and there was this young lady stopping the police jeep asking for a ride. It’s not normal for people to stop a police vehicle and ask for a ride. And that’s when we started talking. So, I guess it’s a community policing relationship,” the affable McCall told BVI News Online. He later studied the woman’s name – Juliette Hypolite, and she learnt his. But little did Mr McCall and his then heartbeat know they would have tied the knot. They did that on Friday, October 21, 2016. The big moment attracted some big shots including Commissioner of Police Michael Matthews, and Prime Minister of St Kitts and Nevis Dr Timothy Harris. 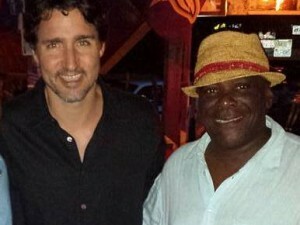 Prime Minister Harris bragged on radio that Mr McCall is his constituent back in their homeland – St Kitts. Mr McCall said the prime minister is a dear friend – not a mere ‘big shot’ as perceived by many. “For me, he (Prime Minister Harris) is not just a big shot. He is a very close friend of mine and also a family friend,” Mr McCall told BVI News Online. The big shots have returned to their own affairs and the confetti have settled. Mr and Mrs McCall are back to what they have been doing for nearly a decade – living soul to soul. “For me, we were cohabiting for about nine years. It is not much different now from the day before I got married,” Mr McCall said after the wedding. They have done so much together, Mr McCall thinks he is qualified to lecture the relationship newbies. “Get to know your partner. Communication and family are also important,” he advised. Mr McCall, who begot a son in a previous relationship, perhaps thinks he is nonetheless the quintessential family man. He loves his son; he loves his other relatives; he loves his wife; and he loves his step-daughter. Any other children anytime soon? “We have two children and we are happy. We have no immediate intention of extending the family at this time,” Mr McCall divulged to BVI News Online, between chuckles and a bit of hesitation. He also admitted that the sometimes arduous job of policing can eat away time that would have been better spent with family. By now, however, Mr McCall has become an expert at the balancing act. “Sometimes when I wake up early morning to go to work, my son is asleep. During that same day when I return, he is asleep. So, sometimes you have to manage. When it is your downtime [at work], you have to spend as much time with your family as possible so that when the hectic times come they will understand,” added Mr McCall, who is also chairman of the Police Welfare Association here in the British Virgin Islands.